Rupert Pupkin Speaks: Warner Archive Grab Bag - THE GREAT RACE on Blu-ray ""
This is one of those much beloved films that I never gave a proper shake. According to the Warner Archive Podcast, it didn't do all that well during its initial run, but found a huge life on television later on and built up its adoration that way. I cannot recall if I found Jack Lemmon and Peter Falk too buffoonish when I first saw it or what, but I cannot fathom what my issue(s) could have been upon this rewatch. First off, this Blu-ray looks spectacular. THE GREAT RACE is just the kind of film with the perfect color pallet for high-definition and Warner Archive hit it out of the park with this transfer. So that's the first thing, but secondly, this film just has so much that is right in my wheelhouse, I cannot imagine what my problem was. Blake Edwards dedicates the film to, "Mr. Laurel and Mr. Hardy" which is lovely and you can absolutely feel the loving homage throughout. Also, there is an obvious direct line to both Hanna-Barbera cartoons and Wile E. Coyote and those are some of my favorite things. Jack Lemmon's Professor Fate character is maybe his largest, most over the top performance and it is a thing of beauty. He really is this nutty cartoon villain of a force of nature and it's a whole lot of fun. He and Tony Curtis being reunited after SOME LIKE IT HOT is memorable too especially because this pairing is less talked about by far than that film and yet both are a hoot. The cast of the film outside of Lemmon and Curtis is quite nice. Keenan Wynn and Peter Fall play parallel sidekicks to Curtis and Lemmon and both are excellent. Natalie Wood is a feisty suffragette reporter covering the Great Race and tagging along to get the inside scoop. Other familiar faces include Dorothy Provine, Denver Pyle and Ross Martin. More things I love about this movie include the fact that it is based around a global race and race movies are awesome (still waiting on a GUMBALL RALLY Blu-ray btw). 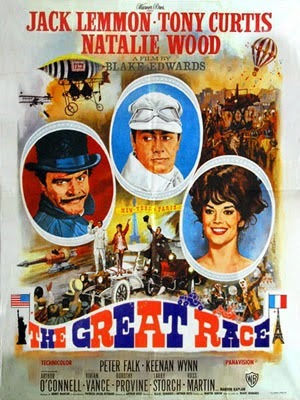 THE GREAT RACE is further unique in that it is a truly epic production (quite expensive at the time it was made) and runs 2 hours and 40 minutes and even kicks off with an overture (and also has an intermission)! IT'S A MAD MAD MAD MAD WORLD is the only comedy I can think of that was made on this scale and I personally think THE GREAT RACE is the far superior film between those two. It's tough sometimes to not be a little disgusted by the scads of cash Hollywood Studios have and continue to spend on large-scale productions. Throwing money at any creative issues one might encounter seems to only lead to sloppy solutions most of the time. The money being spent ends up on the screen, but not in a very efficient way. With a film like THE GREAT RACE, you can see the money and how it made for some truly wonderful production design that absolutely makes the movie its own unique thing. The fantasy world that Blake Edwards creates is just glorious. The film is really multiple genres rolled into one. Each new stopping point along the way becomes it's own mini-genre set piece. It jumps from being a western to an arctic adventure (complete with a real live polar bear) to a swashbuckler and more. It also includes what is probably the greatest pie fight in cinema history. Seeing a filmmaker like Edwards with his command of craft firing on all cylinders with a sky's-the-limit budget certainly makes for an unforgettable, zany and explosively entertaining spectacle like few others in Hollywood history. This Blu-ray includes a supplement in the form of a 16-minute vintage behind-the-scenes featurette. It has some neat b-roll of the actors on set and a narrator talks about each of them and briefly walks is through the filming of a few scenes. Thanks for such an in depth review - I haven't actually seen this movie, but I will definitely check it out. Like yourself, the gumball rally is one I'm waiting on - the DVD is great quality, so the blu ray should be fantastic. Bannon in the Cobra 427 in 1080P - worth waiting for!